Pepita (from Mexican Spanish: pepita de calabaza, “little seed of squash”) is a culinary term for the pumpkin seed or other cultivar of squash. 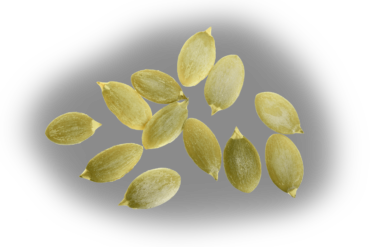 The seeds are typically flat, oval and are brown to green in color. The word “pepita” can sometimes refer to the unhulled whole seed, but most commonly refers to the actual seed as a roasted end product. There are three main types of Pepitas exported from China. The Northeast (NE) and Northwest (NW) are both “shine skin” pepitas with a light brown hull. The Grown Without Shell (GWS) variety is without a hull. Each of these types is graded as AAA (highest quality), AA, or A. The largest quantities of the AAA grade are found in the Northwest and Grown Without Shell varieties. There are only limited amounts of the AAA grade from the Northeast variety. Harvested in China every fall, Red River pepitas are processed at our own facility in Dalian, China. We offer NW and GWS pepitas in both conventional and traceable organic specifications. We pasteurize our pepitas using a validated 5-Log reduction in pathogens. Careful sourcing, testing for micros, re-cleaning, and grading are done to ensure our pepitas are high quality, food safe, and traceable. Pepitas are popular in trail mixes, snack bars, cereals and bakery products. They’re also popular as a stand-alone snack, year-round (not just at Halloween). Pepitas pack a load of nutritional benefits in just a single handful, where you’ll pick up 8.5 grams of protein. They are high in vitamins, minerals and essential fatty acids.